Ronnie Bradford grew up in Chickamauga, Georgia, and graduated from Gordon Lee High School in 1989. He has degrees from the University of Tennessee at Chattanooga (B.S. in Secondary Education, Social Science concentration) and the State University of West Georgia (Master's and Ed. S. in Educational Administration and Supervision). Mr. Bradford began his teaching career in Catoosa County in 1993 after student teaching at Lakeview-Fort Oglethorpe High School and Ringgold Middle School. In 1994 he started teaching at Lakeview Middle School. During his 5 years at LMS he taught English, Georgia History, Science, and Computer Keyboarding along with coaching Soccer, Cross Country, and Track. He also served at the Fellowship of Christian Athletes Huddle Coach and started an Academic Bowl Team at LMS. In 1999 Mr. Bradford became the Assistant Principal and Athletic Director at Ringgold Middle then became the Principal of Ringgold Middle in 2002 where he also coached Soccer. He left Ringgold Middle to open Heritage Middle as Principal in 2005. 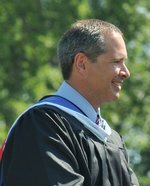 Mr. Bradford became the first Principal of Heritage High School when it opened in 2008. In 2015-16 Mr. Bradford served on Georgia Governor Nathan Deal's Edcuation Advisory Board. On the personal level, Mr. Bradford is married to his high school sweetheart, Amy (Gordon Lee Class of 1991). Amy Bradford is a teacher at Battlefield Primary School in Catoosa County. They will celebrate their 25th wedding anniversary in July, 2018, and have made Catoosa County their home since 1993. They have three children: Emma Grace, Abbey Lee, and Anna Elizabeth. The Bradford family enjoys swimming, camping, hiking, exploring, soccer, trips to the beach and everything having to do with Heritage and trips to Disney World.